Start time :  9:05 p.m. Seems like Keith may have had a guitar problem at the very beginning, but that did not matter as the Stones came out with Street Fighting Man. Nashville was into the show immediately and the momentum continued through Start Me Up and If You Can't Rock Me. Who would have thought that Don't Stop would have turned into the live song that it has. Must be Mick's guitar. The featured album tonight was Exile on Mainstreet and the band started appropriately with Sweet Virginia. During the introductions Mick commented on Chuck's western outfit by asking, "Did you get it locally?" Keith started his set by saying that this is the "2nd time in Nashville in a year" and that it's "starting to feel like home." He continued on after playing The Worst, "Anybody have a cheap house to rent, I need it baby." Once again, the highlight of the night had to be Can't You Hear Me Knocking. Can't get enough of this one. No real surprises in the set tonight. We're hoping to see Hand of Fate pop up in the "arena" set list. Anyway, the Stones showed us again tonight why they are the "World's Greatest Rock 'n' Roll Band." We were sitting next to a couple of 15 year-old boys tonight. While they only had a few concerts under their belts, they sure knew how to rock. Our 2 1/2 year old daughter sings "Don't Stop" in the car. Since there's more generations of Stones fans out here, the Boys should continue to inspire us all with more and more shows for years to come. The Stones put on another one of those amazing shows tonight in Nashville, a definite cut above other one -stop arena shows like Columbus or San Antonio. The Gaylord Center is on the same plaza as the new Country Music Hall of Fame building, and the overall historic musical heritage of this town is in the air everywhere. This is the only show on the tour where between the hotel and the arena, you can walk up and down the stairs of the Ryman Auditorium just for the fun of it. The Stones could have exploited this atmosphere, and in fact they did to an absolute optimal level. The night had an extremely relaxed feel to it, where instrumental parts lasted a bit longer than usual in several songs. The first was the new one Don't Stop, which is going along the same road as Out of Control did in 1997/1998. Clearly Mick's song at the beginning of the tour, you can now see Keith's rhythms invading where it is seems more like Keith's song every time it is played. This is a very entertaining friendly conflict, where speculating about the winner brings just one sensible outcome: the fans and the (BAND)Rolling Stones. The declared album theme of the evening was Exile, which worked well for the country theme. Sweet Virginia was excellent with Keith killing on backup vocals. The only unfortunate thing was guest violinist Franky Gavin (also appeared in Oakland) not having volume for the first half of his solo. More than anyone Keith seemed in the Nashville mindset with his great back up vocals and especially-clear-as-a-bell guitar tonight. Hopefully Keith's fills on Loving Cup traveled straight out of the Gaylord Center straight to the Country Music Hall of Fame, where they should be enshrined and put on display with Merle Haggard's guitar and Gram Parsons' Nudie suit. Before he played The Worst for his first song, Keith pointed out that he was in Nashville twice in a year. Being at the Ryman earlier with Willie, Hank III, (and a bit of Sheryl Crow thrown in for good measure) has as they would say in Tennessee, "done him good!" But an easy country feel was just a nice pacing effect between when the Rock and Roll was on warp speed. Rocks Off continued the album theme while getting the entire arena jumping. Mick said, "One more from Exile", and Tumbling Dice finished us off. Keith's guitar during the "You got to roll me" part was delightfully jagged in its rhythm, bringing the song closer to the great versions they were playing on the Voodoo Lounge tour. In the barrage of songs on the main stage after Keith's set, You Got Me Rocking absolutely smoked the entire arena, between Keith's rhythms and Mick's dramatically desperate vocals. Can't You Hear Me Knocking went back to the open-ended relaxed feel of the night, with the song seeming more extended than usual. Mick's harmonica solo really stood out, with Keith interacting on the rhythm guitar. This part of the show seemed the furthest from Nashville, as it took on a spacy jazz like spirit. Ronnie's guitar was extra psychedelic. So while there was a comfortable theme established, the Stones proceeded to change it up and typically confound our expectations. No sooner than noticing that, we were back to Honky Tonk Women, where Keith, Ron, and Darryl convened in front of Charlie, backing Mick so it seemed like a Hank Williams or Jimmie Rodgers song on steroids. Chuck Leavell's piano part was perfect in the spirit of the night, just as his embroidered shirt which seemed like he borrowed it from the Hall of Fame next door. The Stones played It's Only Rock'n'Roll, Little Red Rooster, and Brown Sugar on the small stage. Brown Sugar was a serioius frenzy, with the crowd getting to the "Yeah, yeah, woo!" part well ahead of Mick. Mick used the A stage/ B stage walkway again, like he does now during Tumbling Dice in arenas. With this use of the walkway Mick is taking things beyond Babylon or No Security. The end of Brown Sugar was an extra delight, with Chuck and Charlie interplaying to extend the end of the song. With an encore of Jumping Jack Flash, the show was done. The amazing quality and consistency of these LICKS shows is really holding up. The nights when Keith, Mick, Charlie, Darryl and Ron are ON seem now to be more a rule than an exception. Another trip, another show? It keeps getting better. Great friends along for the ride, Charlie Mac and Lori; Mr. Cooper and Bill; and the newest member of our Stones crew, Little Ms. Vicki attending her first show. We arrived the evening of Sunday - day before the show. Check in and off to a pub for food, darts and ales. Very nice chatting with everyone. Walking in the direction of our hotel we were checking out all the little music 'alleys' up and down Broadway. Not seeing much of interest we settled into Legends for a few songs. The name rang true for the reason we had all descended upon this town. As we were leaving, the accomplished guitarist noticing my tongued shirt (Philadelphia event) says to me, "hey you guys stay a while, we know some Stones songs." I returned to my seat recognizing the lady on my left who had just arrived. The now world famous Carla Rhodes aka the girl who had her picture made with Mick Jagger after the Atlanta show. It was our pleasure to buy her a drink. This night we would also meet and greet the Swiss and the boys from Holland. Before long the quiet traditional country music had transformed to nearly three hours of Stones rarities and classics - most by request. The place came alive as more Stones people filed in and we were screaming and singing. Before this was over we had heard everything from Dead Flowers to Jumping Jack Flash meets Elvis. Yes I said Elvis, the lead singer was on top of the bar and tables mixing up verse after verse of Sympathy/Suspicious Minds/Paint it Black/I Did it My Way. Quite a taste of creative entertainment. The band, Swamp Grass also mentioned there would be a slightly bigger show across the street on Monday night? Monday was a typical day in Stones world. Trademarks everywhere as we were making new acquaintances from all over the States. An interesting couple was Professor Rob and his new friend Vida - we will not go into what this lady does for a living. Pleased to meet you! If you meet her, ask her yourself. Time had come and we worked our way down to the arena for a pre-party at Rippy's. Plenty of die hard fans, Glimmers, Shidoobees and UC'ers all attending. However there was a dire need for something other than country music for the festivities. We kicked it up a bit with Exile on Main followed with a few minutes of Ya-Ya's complements of Mr. Cooper. The pre-party was done and we made our way into the venue. The lights went down and the sound from the amplifiers blew into my face as Ronnie and Keith loudly launched Street Fighting Man. Sir Mick in tails takes center stage like a whirlwind and the man would not stop for hours to come. White lights filled the arena from behind the stage, from my level it was nearly blinding, they played this one fast and furious. Start Me Up was followed by If You Can't Rock Me. This is pretty awesome this year, I like the way Mick delivers the lyrics. It just seems like such a fresh song. By now the boys, Mick included, are stripped down to t-shirts instead of fancy jackets and costumes. That just tells ya what kinda show this is. Don't Stop. Mick does however take a second between songs to say hello and how are we doing to this seated and reserved Nashville audience. He also welcomes all the 'entertainers' in the audience, after all this town is known as Music City and pretty much everyone plays. Monkey Man was strong and to the point. Mick does his new monkey moves not to be confused with 'the rooster.' Lisa 'hope you are a monkey woman too' Fischer is not on stage for this one. A little breather before Keith starts the un-mistakable Gimme Shelter. The lighting sets the mood and the video shows the band in a nostalgic effect. Lisa steals the show and the crowd loves her. Mick Swagger had a little dance during this appearing much more choreographed than his usual antics. It was actually a nice sequence, looked pretty cool. The band as a whole nailed this one, actually nearly everything was perfect. Ronnie and Keith are on fire tonight making it noticeably easier on the front man. Let me not forget, nice to see you again akissaway. To add to this nearly perfect show Mick asks if we have heard of a thing called 'Exile.' Hmm, yeah I think I have! We sang every word of Sweet Virginia. Outstanding! Mick on acoustic and harp, he actually played that guitar for the entire song. Nice. The crowd, not exactly knowing this one, loved it. Nashville by the way is not the most excitable audience, they were quiet reserved, and maybe they were expecting the Grand Ole Opry' Getting only better, Loving Cup was performed next. The band still giving the set a kind of 'unplugged' sound. A real treat for us. Gimme one drink, from your Loving Cup, and I'll fall down drunk? Just one drink! The days go by at lightning speed, I can't describe this scene, and the sunshine bores the daylights out of me! What else can I say about Rocks Off? Jagger calls for one more in the Exile set, Dice, during which he is down to a sleeveless lime greened tongued t-shirt and uses a back runway, first time all year I have seen this. The video screen is changed a bit too, it appears to be taller running from the top all the way to the stage. During Intros Mick actually sat briefly on a stool and I was having ideas of him on keys for Faraway Eyes (B'ham 94). With the addition of maybe Faraway Eyes, Torn and Frayed and another fittingly Nashville rarity or two this had the potential of being one of the best ever shows. Sorry not to get our hopes up. The script was followed and Keef to a rousing applause took center stage for a great rendition of The Worst and Happy. Never kept a dollar past sunset? Neither did I on this night. The lights went down and the crowd was startled hearing the familiar intro and perhaps as many as six Yow! Yow! screams leading in to Sympathy. Sir Mick in red of course, the stage drenched in red and a fiery tongue on the screen. Gets you every time. After this Mick continued enticing the crowd, boo! boo! How does one spell that anyway? You Got Me Rockin. Keith tore it up. Again after this Jagger continues to work with Yeah, Yeeaah, Yeeaahh! Charlie follows with a little noise from the skins. Can't You Hear Me Knockin? accompanied by the wall of video. This song goes on forever, Ronnie owns it. The man is awesome tonight, landing every lick. Excellent display of talent from everyone on this. The animated 'rider' appears on the screen for Honky Tonk but more briefly than some other towns. Could this get any better? Satisfaction is sending this show into the books as one of the better ones. Incredible energy and drive out of the band tonight. The sound, from my seat is probably the best I have ever heard! Not muffled, overdriven or echoed. Loud and very clear. After the trek out to the B, Keith cuts Mick off as he was about to speak to his followers. Keith's guitar lead into IORR, the band followed and Mick resigned that the show would go on. During Little Red Rooster a Let It Bleed album cover with pen were tossed up. Mick seemed to carefully dance around it without scooping it out of sight as he does with other debris. Looked like someone might be getting an autograph until the roadie came up and disposed of it. Returning to the center of the B, Mick mocked an autograph. Some poor fan almost had the real thing? 'Gold coast slave ship bound for cotton fields' I knew this one would bring the house down. Might have been the highlight here on the B as Brown Sugar had everyone finally getting into it. 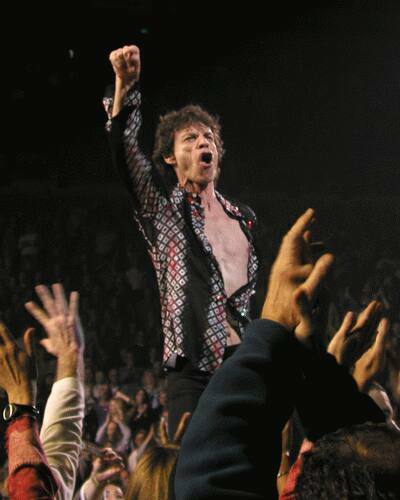 Jagger motioning with his arms, 'I said yeah, yeah, yeah, WOW!' Much too soon they take a bow and exit the rear of the arena. After two hours of driving home some of their greatest hits, they were disappearing from sight. Returning for a single encore, better, faster, louder, and bigger than before. Jagger in some kind of blinking red shirt. Confetti blown in such quantities that we could not even see the stage! Amazing. One thing I saw here was a some kind of step Mick did, timed just right with the lyric, some kind of twitch, kick, split in mid air. I don't know how to describe other than his feet left the floor and for a second it looked like 81 or so. Keith is wearing a blazer, shirtless underneath. By the end, Jagger has unbuttoned his shirt except for one. Yup, there he was, 59 years old, bare-chested and Jumping Jack Flash in such a fashion no one will question his ability to perform. Dude is cut, I'll give him that. Final bows and then the lights return signaling it is time to exit the arena. What a great show, in my opinion the best sounding one in my 20+ years of Stones shows. Certainly a lot of fun, my voice is totally gone by now. For me this tour started in Beantown with 'New Beginnings' and ends in Nashville with the 'Legends.' What a great tour. I can't believe it is over for me. What will I have to look forward too? I dunno, maybe MSG in 2003? Maybe Europe? See ya there! the stones are just gettin better-n-better. this is our 4th show on this tour and the best so far, even though all of them are great. exile was highlighted this time, with sweet virginia, loving cup, rocks off and tumblin dice. the stones were jammin tonight, as several songs got extended. don't stop was one of 'em, the boys just keepin the rhythym poundin for us to enjoy. can't you hear me knockin' was just awesome. the stones have really worked on this one, and it sounded great. bobby keys has never sounded better, and ronnie made sure mick was done with his harp solo before blowin us away with his guitar licks. keith was really on tonight, dishing out some lead guitar on sympathy and a few others. playing in the music city, the stones gave us an outstanding show. if they sound this strong and committed to their music at this stage of their careers, i see no reason to believe they will not continue to give us fans more tours in the years to come. but, just in case, ill continue to try and see 'em as many times as i can this time around, 'cause the boys are hot! Thanks to Axel Schumacher, Rob Graham and Pete for news links.